Charles IV (Carlos Antonio Pascual Francisco Javier Juan Nepomuceno José Januario Serafín Diego; 11 November 1748 – 20 January 1819) was King of Spain from 14 December 1788, until his abdication on 19 March 1808. In 1799, he authorized Prussian aristocrat and scientist Alexander von Humboldt to travel freely in Spanish America, with royal officials encouraged to aid him in his investigation of key areas of Spain's empire. Humboldt's Political Essay on the Kingdom of New Spain was a key publication from his five-year travels. 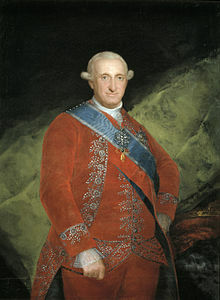 Godoy continued Abarca de Bolea's policy of neutrality towards France, but after Spain protested the execution of Louis XVI of France, the deposed king, in 1793, France declared war on Spain. After the declaration, Portugal and Spain signed a treaty of mutual protection against France. In 1796 France forced Godoy to enter into an alliance, and declare war on the Kingdom of Great Britain. As a consequence, Spain became one of the maritime empires to have been allied with Republican France in the French Revolutionary War, and for a considerable duration. Spain remained an ally of France and supported the Continental Blockade until the British naval victory at Trafalgar, when Spain became allied with Britain. However, after Napoleon's victory over Prussia in 1807, Godoy again steered Spain back onto the French side. This switching of alliances devalued Charles' position as a trustworthy ally, increasing Godoy's unpopularity, and strengthening the fernandistas (supporters of Crown Prince Ferdinand), who favoured an alliance with the United Kingdom. Economic troubles, rumours about a sexual relationship between the Queen and Godoy, and the King's ineptitude, caused the monarchy to decline in prestige among the population. Anxious to take over from his father, and jealous of the prime minister, Crown Prince Ferdinand attempted to overthrow the King in an aborted coup in 1807. Riots, and a popular revolt at the winter palace Aranjuez, in 1808 forced the king to abdicate on 19 March, in favor of his son. Ferdinand took the throne as Ferdinand VII, but was mistrusted by Napoleon, who had 100,000 soldiers stationed in Spain by that time. The ousted King, having appealed to Napoleon for help in regaining his throne, was summoned before Napoleon in Bayonne, along with his son, in April 1808. Napoleon forced both Charles and his son to abdicate, declared the Bourbon dynasty of Spain deposed, and installed his brother, Joseph Bonaparte, as King Joseph I of Spain. Following Napoleon's deposing of the Bourbon dynasty, the ex-King, his wife, and former Prime Minister Godoy were held captive in France first at the château de Compiègne and three years in Marseille (where a neighborhood was named after him). After the collapse of the regime installed by Napoleon, Ferdinand VII was restored to the throne. The former Charles IV drifted about Europe until 1812, when he finally settled in Rome, in the Palazzo Barberini. His wife died on 2 January 1819, followed shortly by Charles, who died on 20 January of the same year. Sir Francis Ronalds included a detailed description of the funeral in his travel journal. Well-meaning and pious, Charles IV floundered in a series of international crises beyond his capacity to handle. He was painted by Francisco Goya in a number of official court portraits, which numerous art critics have seen as satires on the King's stout vacuity. 7 March 1774 Born and died at El Escorial; baptized on the same day he was born, with Charles III representing "the Holy Father" at the christening. Pope Clement XIV celebrated Carlos' birth and sent the infant consecrated swaddling clothes. 7 January 1830 Born at the Royal Palace of Aranjuez, she married John VI of Portugal in 1785 and became Queen consort of Portugal in 1816. Had issue, including the future Pedro I of Brazil. She died at Queluz National Palace. 2 July 1782 Born and died at the Royal Palace of La Granja de San Ildefonso. 22 July 1798 Born at the Royal Palace of Aranjuez, she married her uncle Infante Antonio Pascual of Spain in 1795. She gave birth to a stillborn son in 1798 and died shortly thereafter. 11 June 1783 Born at the Royal Palace of El Pardo and died at the Royal Palace of Aranjuez. After his birth, his father pardoned all of the convicts from Puerto San Julián as a sign of celebration. 13 March 1824 Born at the Royal Palace of La Granja de San Ildefonso, she married Louis, King of Etruria in 1795 and had issue, including Charles II, Duke of Parma. Became Duchess of Lucca in her own right in 1817 and died in Rome in 1824 of cancer. 11 November 1784 Twins, born and died at the Royal Palace of La Granja de San Ildefonso. Their birth was an important event for the people of Spain and provided security for the succession, a security which was truncated with the early deaths of Carlos and Felipe. 29 September 1833 Born and died at El Escorial, he succeeded his father as King in 1808, but was deposed by Joseph Bonaparte one month later. Married Princess Maria Antonia of Naples and Sicily in 1802, no issue. Re-instated as King in 1813. Married Maria Isabel of Portugal in 1816, had issue. Married Maria Josepha Amalia of Saxony in 1819, no issue. Married Maria Christina of the Two Sicilies in 1829 and had issue, including the future Isabella II of Spain. Died in 1833. 10 March 1855 Born at the Royal Palace of Aranjuez. Married Infanta Maria Francisca of Portugal in 1816 and had issue. Married Maria Teresa, Princess of Beira in 1838, no issue. First Carlist pretender to the throne of Spain as "Carlos V". Use the title "Count of Molina" between 1845 and his death in 1855. 13 September 1848 Born at the Royal Palace of Madrid, she married Francis I of the Two Sicilies in 1802 and had issue, including the future Ferdinand II of the Two Sicilies. Queen consort between 1825 and 1830, her husband's death. Died at the Palace of Portici in 1848. 2 November 1794 Born at the Royal Palace of Aranjuez and died at El Escorial of smallpox. 1 March 1794 Born at the Royal Palace of Aranjuez and died at the Royal Palace of Madrid. 13 August 1865 Born at the Royal Palace of Aranjuez, he married Princess Luisa Carlotta of Naples and Sicily in 1819 and had issue. Died in Madrid in 1865. ^ Portugal; de), José Ferreira Borges de Castro (Visconde; Biker, Julio Firmino Judice; Estrangeiros, Portugal Ministério dos Negócios (19 June 2018). "Supplemeto á Collecção dos tratados, convenções, contratos e actos publicos celebrados entre a corôa de Portugal e as mais potencias desde 1640". Imprensa nacional – via Google Books. ^ Ollie Bye (3 February 2016). "The French Revolutionary Wars: Every Other Day" – via YouTube. ^ Griffin, Julia Ortiz; Griffin, William D. (2007). Spain and Portugal:A Reference Guide from the Renaissance to the Present. Facts on File. p. 151. ISBN 978-0-8160-4592-1. ^ "The Royal Favorite: Manuel Francisco Domingo de Godoy, Prince of the Peace". www.napoleon-series.org. ^ Ronalds, B.F. (2016). Sir Francis Ronalds: Father of the Electric Telegraph. London: Imperial College Press. p. 188. ISBN 978-1-78326-917-4. ^ "Sir Francis Ronalds' Travel Journal: Naples and Pompeii". Sir Francis Ronalds and his Family. Retrieved 23 February 2018. ^ von Pastor, Ludwig Freiherr (1952). The History of the Popes, from the Close of the Middle Ages. Michigan: Kegan Paul. p. 201. ^ a b Real Academia Matritense de Heráldica y Genealogía (2007). Anales de la Real Academia Matritense de Heráldica y Genealogía. Vol. X. (in Spanish). Madrid: RAMHG. p. 330. ^ Senatore, Mar'a Ximena (2007). Arqueolog'a e historia en la colonia espa–ola de Floridablanca, Patagonia, siglo XVIII (in Spanish). Madrid: Teseo. p. 149. ISBN 978-987-1354-08-5. ^ Real Academia Matritense de Heráldica y Genealogía (2007). Anales de la Real Academia Matritense de Heráldica y Genealogía. Vol. X. (in Spanish). Madrid: RAMHG. p. 332. ^ Palazón, Juan Manuel Abascal (2010). José Vargas Ponce (1760–1821) en la Real Academia de la Historia (in Spanish). Madrid: Real Academia de la Historia. p. 54. ISBN 978-84-15069-00-3. ^ a b Hilt, Douglas (1987). The Troubled Trinity: Godoy and the Spanish Monarchs. Alabama: University of Alabama Press. p. 292. ISBN 978-0-8173-0320-4. ^ Zavala, José María (2013). La maldición de los Borbones (in Spanish). Mexico: Random House Mondadori. p. 16. ISBN 978-84-01-34667-5. ^ "1 Real - Carlos IIII, Chile". en.numista.com. Numista. Wikimedia Commons has media related to Charles IV of Spain. "Charles IV., king of Spain" . Encyclopædia Britannica (11th ed.). 1911. "Charles IV., king of Spain" . The American Cyclopædia. 1879.